So I was very excited to see the new format that the Virtual Village had decided to use for the latest installement of the Emerging Technology newsletter. Instead of mocking up a slick pdf version and sending an all staff email like before, they decided to create it using LetterPop! With so much going on (and so much to keep ontop of) in the area of emerging technologies, it's nice to see staff trying out new tools and playing with options. And although I wouldn't advocate that LetterPop be used as a communication channel for your customers, it does make creating small informal newsletters for staff a breeze. If you follow the 5 page newsletter, you can easily see we're diving into many new areas. The projects that our Technology Scholars are doing are progressing along at full speed and the construction of the two Learning and Gaming labs and new Discovery Desk begins in the Virtual Village (aka V2) next week. 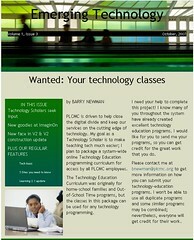 PS: Jamie, the newsletter looks great!